You can’t beat a real tree at Christmas – the perfectly imperfect shape, the way every one is unique, the shadows they cast in the twinkle of the fairy lights. And the smell. Oh, the smell. Does anything say Christmas better than the smell of a real tree? But here’s the sad thing. I haven’t had a real Christmas tree since I was pregnant with my eldest! That was 14 years ago. We always had a real Christmas tree growing up and I loved the excitement of decorating them. It really felt like Christmas when you could smell the tree. We had them as young adults too, but then my son was born. My husband insisted that it wasn’t sensible to have a real Christmas tree with a baby around and persuaded me to go for an artificial tree. I wasn’t happy, but I went along with it. That tree lasted us all the way to last Christmas – looking very miserable in the wrong house. After Christmas last year, I insisted we throw it away because it was damaged (it had been for several years) and getting rid of it was the only sure way of guaranteeing we wouldn’t put it up in our lovely new house. So you can imagine how pleased I was when, just at the right time, Pines and Needles got in touch, asking if I would like to review a real Christmas tree. Is the Pope Catholic? My kids are old enough now not to do any damage to a tree and it would be lovely to have our first Christmas in our new house with a real tree. 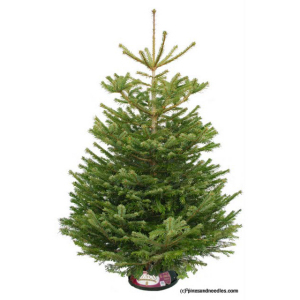 Pines and Needles is a premium Christmas tree brand, which has been trading for 20 years. They are based in London and the South East. But would they deliver to Gloucestershire? Yes, they would! They grow their trees on their own plantations in a sustainable way – planting three new ones for every tree that is felled. 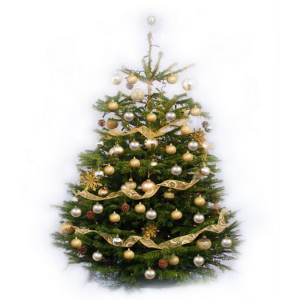 They really do provide the full service – supplying lights, decorations and stands for those who want them – and they can even take away trees for recycling. You can order your tree for delivery or pop into one of their shops (mainly in London) to choose your own. Pines and Needles supply everything from tiny trees through to 20ft trees! The company also gives to charity and this year are raising money for Action for Children. Regular readers will know I’m not one for doing Christmas too early, so I don’t yet have my tree, but I wanted to let you know about Pines and Needles early to give you a chance to check them out! We will receive a free Christmas from Pines and Needles for this review. All views are my own. Oh wow a real pine tree to review? I hope it smells wonderful! We used to have two pine trees in our garden and they always smelt gorgeous!